With cooler weather here, this is a nice start to the day, warm and tasty, sweet and crunchy, everyone loves a crisp!! 16 Apples, cored, peeled and sliced into 12ths right into sprayed 10 x 15 baking dish. (Gets too mushy if you cut into 16ths) Sprinkle some lemon juice over apples so they don’t brown while finishing up the rest. Preheat oven to 375 degrees. Spray PAM into 10 x 15 (can use 9×13) baking dish. Place sliced apples into dish. Sprinkle about ¼ cup flour over the apple slices and toss and a few tablespoons of cinnamon sugar and toss well. In mixing bowl combine flour, cinnamon, oats and brown sugar. Cut in the room temperature butter until well mixed and crumbly. 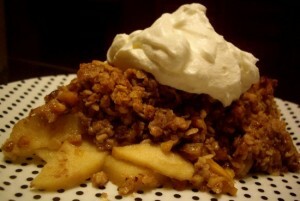 Place crumb mixture over apples to cover completely and pat down lightly with spoon or hands. Bake at 375 degrees for 40 minutes until top browns slightly. If not browning, turn oven up to 400 for last 5 minutes. Allow additional time to rest and cool before serving—about 10 minutes. Top with a dollop of whipped cream. Do you have a favorite, easy recipe you would like to see here?? This entry was posted in B and B recipes, breakfast, desserts by Doug Erickson. Bookmark the permalink.